Last week, a report surfaced from the Sundance Film Festival that production starts today, Monday, January 23, on both Avengers: Infinity War and the untitled Avengers sequel, which are both shooting back-to-back. Earlier today, the Russo Brothers confirmed this report, by sharing the first photo from the set of Avengers: Infinity War, although it doesn't feature any members of the star-studded cast. Instead, this photo showcase a few of the large trailers that are used by the stars during production, and with a cast that could feature upwards of 67 characters, this may be just a small fraction of the trailers that are used on set. The Russo Brothers took to Facebook this morning to share this image, which could very well be the first of many that surface from this production. Both movies are shooting on a rumored budget of $500 million, with the back-to-back shoot expected to last upwards of six months, although earlier reports revealed that the production will span a whopping nine months. Marvel hasn't issued any story details at this time, but we have recently gotten some confirmations about who will be showing up in this big screen adventure. A recent casting call mentioned previously-established MCU stars such as Josh Brolin (Thanos), Chris Hemsworth (Thor), Sebastian Stan (Bucky/Winter Soldier), Scarlett Johansson (Natasha Romanoff/Black Widow), Jeremy Renner (Clint Barton/Hawkeye), Chris Evans (Captain America/Steve Rogers), Elizabeth Olsen (Wanda Maximoff/Scarlet Witch), Samuel L. Jackson (Nick Fury), Paul Rudd (Scott Lang/Ant-Man), Paul Bettany (Vision), Chadwick Boseman (T'Challa/Black Panther), Mark Ruffalo (Bruce Banner/Hulk) and Robert Downey Jr. (Tony Stark/Iron Man), Chris Pratt, (Star-Lord), Zoe Saldana (Gamora), Dave Bautista (Drax the Destroyer), Karen Gillan (Nebula), Vin Diesel (Groot), Bradley Cooper (Rocket Raccoon), Benedict Cumberbatch (Doctor Strange), Benedict Wong (Wong) and Brie Larson (Captain Marvel). It was later confirmed that Tom Holland will swing by as Spider-Man, while another rumor surfaced that Liv Tyler could be returning as Betty Ross from the Phase 1 movie The Incredible Hulk. There is another recent casting addition, though, that has many fans quite intrigued. Earlier this month, we reported that Peter Dinklage has been cast in Avengers: Infinity War, although his role has not yet been revealed. Many fans have speculated that he is playing MODOK (Mental/Mobile/Mechanized Organism Designed Only for Killing), which also hasn't been confirmed. Captain America: Civil War writer Christopher Markus, who is also writing Avengers: Infinity War with his writing partner Stephen McFeely, said in an interview last year that he wants to find a way to bring MODOK into a Marvel movie. There is still no confirmation as to who Peter Dinklage is playing, but another theory has surfaced that Peter Dinklage is playing Pip the Troll, a character who was actually featured in the Infinity War comics. In related news, Marvel's Louis D'Esposito took to Twitter this morning to reveal a new photo from the Black Panther set, revealing a director's chair that features the new Black Panther logo. The executive producer revealed that he has been spending his "mornings with Black Panther and his afternoons with Avengers: Infinity War, which is made possible by both movies filming in Atlanta at the same time. Jeremy Renner and Elizabeth Olsen also revealed in a video interview from the Sundance Film Festival that they still haven't seen a script yet, even though production is starting today, although Elizabeth Olsen said that she doesn't start filming until April. However, Dave Bautista revealed on Twitter that he actually does start filming today, and he still hasn't seen a script yet, adding the hashtag #MarvelShroudOfSecrecy. 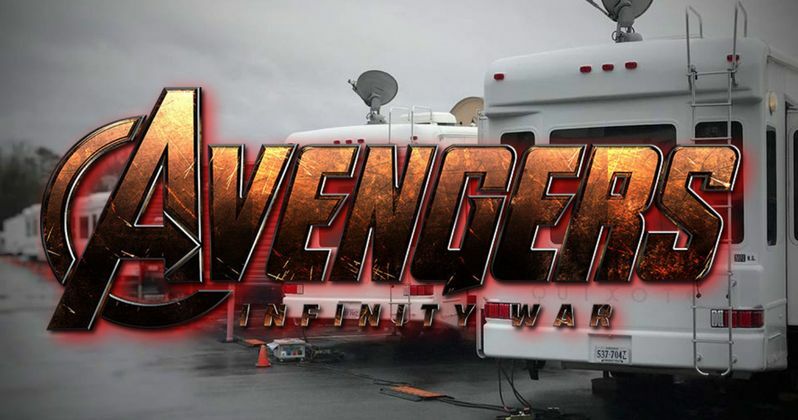 Take a look at these new photos from the set of Avengers: Infinity War and Black Panther as filming continues on both of these highly-anticipated Marvel movies, along with Jeremy Renner and Elizabeth Olsen's video interview and Dave Bautista's tweet below.